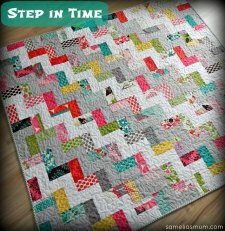 This quilt tutorial shows you how to create a great quilt that has a steady pattern, but allows for personal style and creativity. This tutorial is also adaptable so you can create whatever size quilt you're in the mood for! "My Step in Time Quilt was originally published in Australian Homespun magazine, early 2012. It’s a fun and easy quilt to make and perfect for a beginner who wants to play with some pre-cut fabrics. It’s also a fun weekend project for a more experienced quilter."